Shine on you almost diamond! Home Uncategorized Shine on you almost diamond! John Borthwick‘s first day in Thailand seemed far from auspicious — but it has been uphill from thenon. 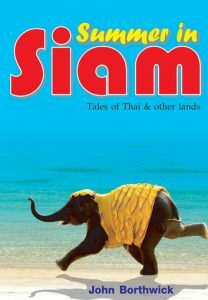 Dropping him in the middle of everything from three-day tribal weddings, elephant polo follies and pristine islands to Pattaya’s bacchanalian nightlife, Thailand has kept John and his pen constantly on the move. One of Australia’s leading travel authors, John Borthwick has gathered here the best of his years of Thailand adventures, plus a swag of vivid tales from his wanderings in India, Xinjiang, the Himalayas, Borneo, Bali, Laos, Vietnam and the Philippines.